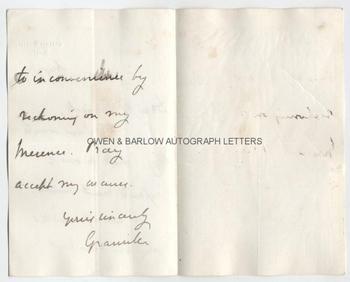 GRANVILLE LEVESON-GOWER, LORD GRANVILLE Autograph Letter Signed. British (English) Liberal statesman. Three times British Foreign Secretary. ALS. 2pp and integral blank leaf. Walmer Castle, Deal. August 7th 1879. 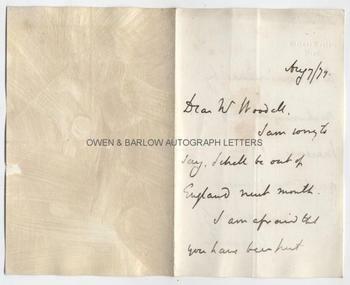 To [William] Woodall. Together with a fine contemporary photograph. "I am sorry to say, I shall be out of England next month. I am afraid that you have been put to inconvenience by reckoning on my presence. Pray accept my excuses." 8vo. Approx 7 x 4.5 inches. Mounting residue on verso of integral blank leaf, else fine. 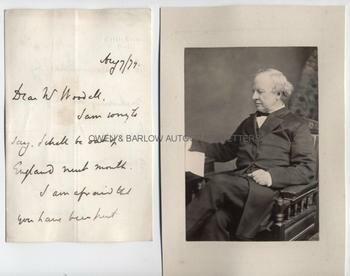 The portrait of Lord Granville is a fine 19th century silver print photograph. It measures approx 6 x 4 inches (excluding mount) and is laid down on card from album leaf. It shows Lord Granville in a beautifully tailored frock-coat, three-quarter-length, seated, turning to his right and studying a paper. There are slight mounting traces to verso but photograph is in fine condition. 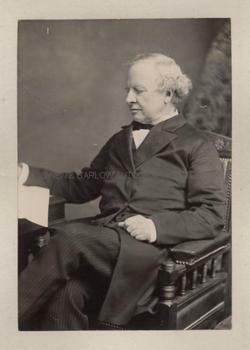 Granville George Leveson-Gower, 2nd Earl Granville (known simply as Lord Granville) was possibly the greatest Foreign Secretary of the 19th century. He was always closely allied with his friend W.E. Gladstone and for 30 years was the leader of the Liberals in the House of Lords. He led the Liberal Party itself from 1875 to 1880. He was three times Foreign Secretary, firstly in the administration of Lord John Russell and, subsequently, under Gladstone. His policy of avoiding national alliances and pacific negotiation kept Britain free from involvement in foreign wars and greatly improved relations with the United States following the American Civil War. He was a great believer in education and a champion of education for women and for 35 years was chancellor of London University.